USC School of Architecture students and professor Andrew Liang, far right, spent 15 weeks studying urbanism in Asia. Europe has long been the standard of comparative study for architecture students, but when the USC School of Architecture announced its inaugural 15-week study abroad tour of urbanism in Asia last year, USC junior Joyce Tsai couldn’t resist. It is this reality that has focused academic eyes on Asia – particularly China, a country which USC architecture professor Andrew Liang calls the new frontier of city-making. “Nowhere are cities rising, evolving and mutating faster, and herein lies an unparalleled opportunity to look at city development and urban theory within a compressed time frame,” said Liang, who launched this inaugural Asia Architecture and Urbanism study abroad program (AAU) in the fall of 2010. By examining city evolution, students develop insight into architecture’s direct, reciprocal relationship with urbanism, which reflects social, political and economic forces. This knowledge then can be leveraged to examine the cycle of life and death of American cities. For example, high-speed rail in America is mired in bureaucratic discourse, according to Liang. But in Asia, students immediately see that astounding levels of mobility – social, economic and otherwise – is enabled by modern infrastructure and interconnectivity between cities. The inspiration for AAU was borne from a 2008 study abroad program in China, India and Korea led by Paul Tang, a faculty member who relocated to Shanghai in 2010 to oversee the USC School of Architecture’s programs there and launch a private practice. Tang said AAU offers architecture students a humanities component that usually is compromised at the undergraduate level. “The program emphasizes social and cultural studies, which broadens the students’ experience and transforms the way they look at architecture,” said Tang, who helped with logistics in Shanghai and also recruited corporate and academic partners. 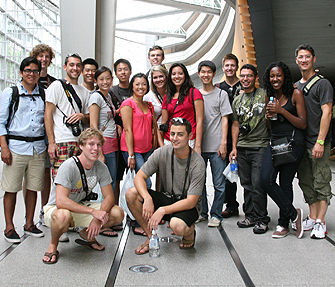 In all, 17 USC architecture students selected from a competitive process toured 14 cities in Japan, Korea and China. Destinations on the tour carefully were picked to represent various stages of urban evolution – from fully developed to nascent. Tokyo, the ultra-dense and hyper-efficient launchpad for the program, is arguably the most developed and advanced of the cities on the tour. There the students studied the impact of a robust public transportation system on the city – and the opportunity it provides for rethinking architecture and design. The next stop was in Seoul, whose ambition is to chase and surpass Japanese cities in quality of life, convenience and efficiency, Liang said. Students later examined Hong Kong as an example of a city with limited physical growth potential but great ambition to continue as a global force. A high-speed rail currently under construction will connect to the thriving Chinese city of Shenzhen in a mere quarter-hour. Critical infrastructure elements indeed can be strategic, Liang explained, offering mutual growth and empowerment. Then it was onto various cities in China, where first-, second- or third-tier urban centers are undergoing astoundingly rapid growth. Shanghai was the final stop, where students lived and worked for the final eight weeks of the semester. Students were tasked with developing and presenting either the design of a transit hub at Hongqiao International Airport or the redevelopment of Shanghai’s World Expo 2010 site. Both sites are real urban projects being undertaken in Shanghai. The international design firm Gensler also hosted a three-week student seminar centering on the Shanghai Tower, which upon completion in 2014 will be the tallest structure in China and the second-tallest in the world. Students blogged daily about what senior Taylor Cornelson called a mental, intellectual and creative journey. “I’ve seen a lot of the Western preconceived notions about how cities should function turned on its head,” said Cornelson, who described one Tokyo hotel that occupied floors 43 and up, with a disconnected lobby. The reception from students and partners has been positive; the school likely will be supporting encore Asia programs later this year and in 2012. Other study abroad programs are in various stages of development. USC School of Architecture dean Qingyun Ma, who was educated in China and has a bustling practice there, said an exceptional education will challenge an architecture student’s basic assumptions and expand their horizons. “We launch all of our programs with this mission in mind,” he said.